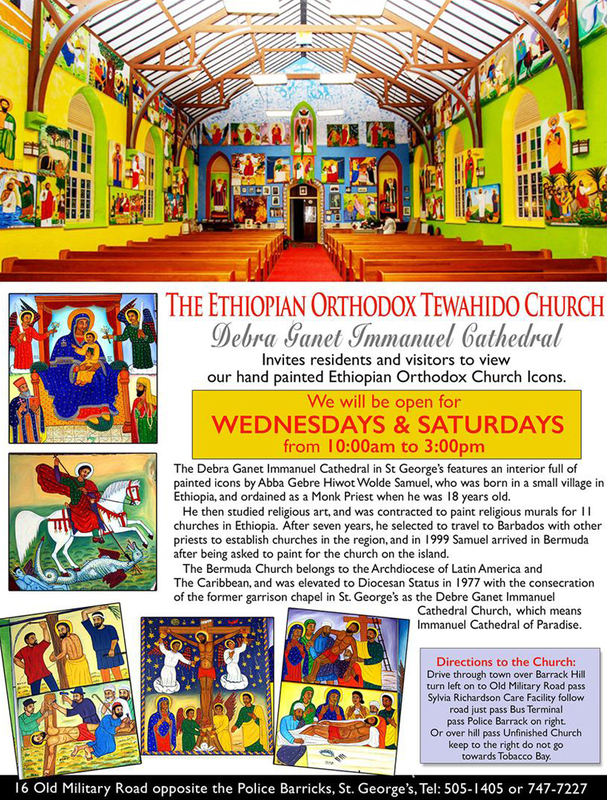 Residents and visitors are invited to view the hand-painted icons at the Ethiopian Orthodox Tewahedo Church, which will be opening to the public, every Wednesday and Saturday, starting Wednesday, July 5th throughout the summer until the end of August. The cathedral features an interior full of painted icons by Abba Gebre Hiwot Wolde Samuel, who was born in a small village in Ethiopia, and ordained as a Monk Priest when he was 18 years old. He then studied religious art and was contracted to paint religious murals for 11 churches in Ethiopia. After seven years, he selected to travel to Barbados with other priests to establish churches in the region, and in 1999 Samuel arrived in Bermuda after being asked to paint for the church on the island. The Bermuda Church belongs to the Archdiocese of Latin America and The Caribbean, and was elevated to Diocesan Status in 1977 with the consecration of the former garrison chapel in St. George’s as the Debre Ganet Immanuel Cathedral Church, which means Immanuel Cathedral Of Paradise. All roads lead to God….very colourful.